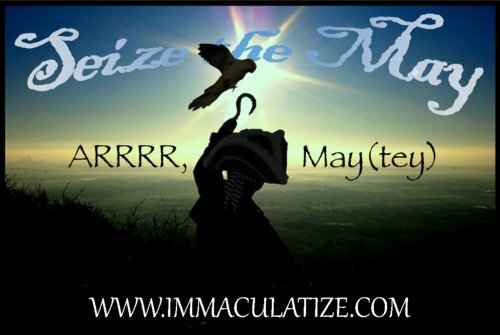 Group Immaculata 4: Seize The May! Seize The May, like other group Immaculatas, is all about goal setting. For me personally, it’s about getting back on track, and my goals (detailed below) entail health and creativity. For you it can be something you’ve been wanting to do for a while, or something you’ve never done before. You are welcome to choose anything you’d like, I’d only recommend that it be realistic, yet challenging enough that you’ll feel a genuine sense of accomplishment when the month is over. In March, Immaculata participants: Learned to cook, went gluten-free, started worked on a novel, wrote and submitted a dissertation prospectus, read Marx’s Capital, exercised 6 days a week, ran a bunch of stairs, applied to a university, mediated daily, practiced drums, painted, penciled, and inked 4 paintings, took Salsa lessons, designed a mini-comic, composed and produced a song, lost 15 pounds, finished a business plan for a restaurant, wrote and produced a live comedy show, shot two music videos, built a goddamn lamp, and a whole lot more. It was totally awesome. Ultimately it’s up to you! Set the goals, make a plan, and then make it happen. If you haven’t already, join The Immaculata Facebook Group. It’s a fantastic way to share your goals, and a really fun, creative group of folks that will help motivate and support you. 1. Decide what goal/project(s) you want to finish in May.